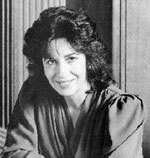 A child prodigy, equally talented in composition, extemporization, and also technically brilliant, Angela Brownridge first performed in public at the age of seven and by fourteen was appearing on the concert platform regularly as a concerto soloist and recitalist in the United Kingdom and abroad. She was awarded a scholarship to Edinburgh University where she graduated BMus, with a further scholarship taking her for a two-year period of study in Rome. She later won an Arts Council Award and financial assistance from the Vaughan Williams Trust to study with Maria Curcio in London. Since then Angela Brownridge has appeared in recital and concerto performances throughout Britain, Western and Eastern Europe, the United States, Canada and the Far East. She has played in all of the major London concert halls and appeared at the Bath and Edinburgh Festivals. She broadcasts regularly for the BBC and for other radio stations around the world.